We recently revamped our pipette line with a few new designs! One of the new designs is our fabulous Squiggle Pipettes. Learn more below! 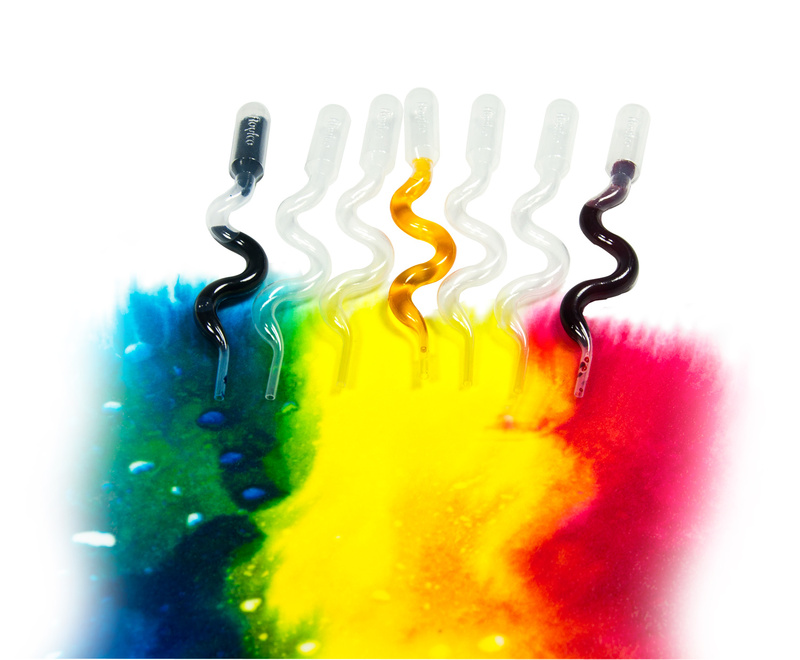 Squiggle Pipettes feature an interesting squiggle design that helps to distribute paint evenly onto paper. Learn more about this product here! Pipettes are not only a great tool to use for painting, but can be incorporated into fine motor exercises–the motion of squeezing the bulb helps to get kids working out their pincer grip! If you are planning to paint with the pipettes, use watercolor paints. To use your pipettes, first squeeze the bulb to press out all the air. Dip the nozzle into a container of watercolor and release the bulb to suction the paint into the pipette. Squeeze the bulb again to release the paint over your sheet of paper. You can use the Squiggle Pipettes to color your art! Here are some ideas you can try for yourself! Click on the links to be taken to the full tutorials. • Make your own giant weaving mat using only Color Diffusing Paper, paint and Squiggle Pipettes! Cut the dried colored paper into strips and weave them in and out of each other to make a beautiful woven mat. • Learn our secret for color-resist painting! We use Squiggle Pipettes to add color to the flag designs. • Color your own clothes! A paper vest, that is. Find more about how to design your own vest at the link. • Form your art into beautiful images of animals using basic shapes! Squiggle Pipettes are used to make the painted images. This entry was posted in Art, Crafts and tagged color diffusing paper, diy art, fine motor skills, kids art, kids games, paint projects, painting, painting tools, pincer grip, pipettes, squiggle pipettes, watercolors by roylcoblog. Bookmark the permalink. What a fun art tool! Thanks for sharing on #ToddlerFunFriday!